It’s been a while since I posted a page from one of the Kamera Calendars, so he is a scan of my own copy of the 1960 Kamera Calendar. This one features a studio shot of Madeleine Mado (Maria Hale) in long blonde wig stood at a dressing table. I’ll be adding a gallery of the 1960 calendar shortly. 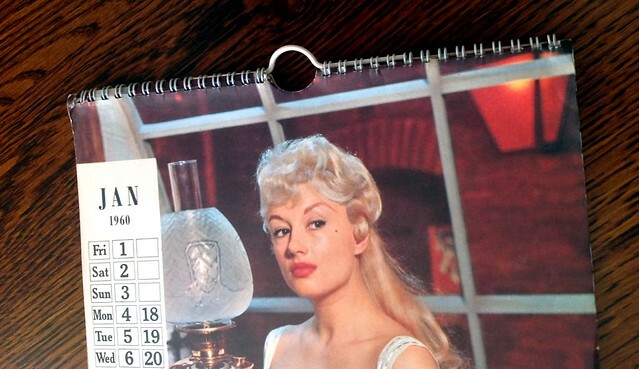 A better version of the April page of the 1960 Kamera Calendar featuring Pamela Green. Another scan from my own copy of the 1960 Kamera Calendar, this time Mary Deighan and her lovely rear view from the March page of the 1960 Kamera calendar. Taken on the fly poster set, you can’t complain about the view on this one as Mary has a great arse! The second post of the 1960 Kamera Calendar from my own scanned copy. This time Julie gracing the February page sporting a wonderful black negligee posing on a sheepskin rug. As discussed in this post I now own an almost immaculate copy of the the 1960 Kamera Calendar and I’ve decided to re-post the 1960 calendar month by month with my own scans. Above is Pamela Green posing for January and I did very little to the scan other than some minor spots from the scanner and a slight colour adjustment. The original scan was twice the size of this image and as clear as ever. Last week I had an email come through from Ruth, the daughter of Don (87) who recently passed away, but was a fan of Harrison Marks. Amongst his effects she had found as she described it ‘a good clean copy’ of the Harrison Marks 1960 calendar as shown on my blog. She had considered trying to put it up on eBay, but wondered if I was interested in it first, which I was. I replied to the kind offer by saying I was interested and could I see some photo’s of the calendar and what did she consider a reasonable offer for the calendar. The above images are the actual images that were sent through from Ruth and as you can see the quality of it looked to be excellent. 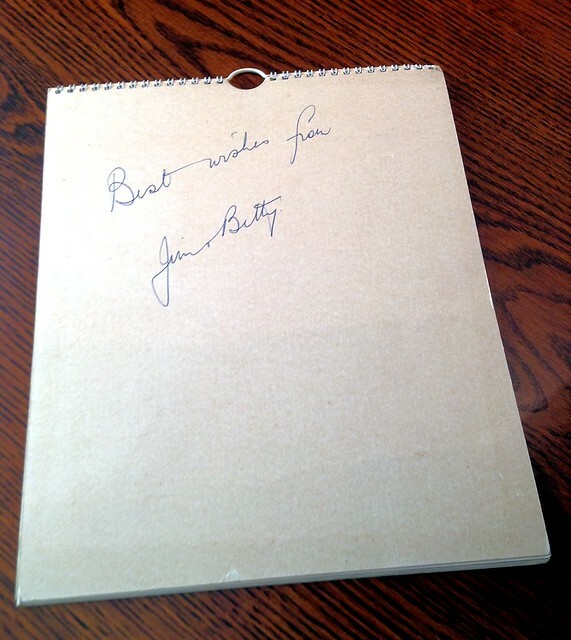 As part of the conversation Ruth also mentioned that on the cardboard backing of the calendar, her aunt, who sent the calendar to Don all those years ago, had written on it and it says ‘Best wishes from, Betty and Jim’ and would that matter, but to me that just added character and a story to the calendar. As to an offer for the calendar Ruth had the following suggestion – ‘What I would say is that my dad knew he was very ill and sorted out last wishes before he died. He chose two charities for donations, one of which was Parkinson’s UK. The reason for this was that his long time friend Jim – mentioned on the back of the said calendar died of Parkinsons. So he would think it quite a hoot if the old calendar generated a bit of cash to go toward that charity’. Anyway I was interested and still wanted the calendar, so we agreed that we would proceed on good faith rather than ‘faffing’ around with eBay and Paypal. I would make a £15 donation to Parkinson’s UK via the ‘Just Giving‘ website and then Ruth would post me the calendar. I made my donation as agreed and sent Ruth proof of the donation and she then posted the calendar on to me as agreed. The calendar arrived yesterday and upon opening it up to my surprise I have an almost immaculate copy of the 1960 Harrison Marks Kamera Calendar! So thanks to Don I am now the proud owner of my first and favourite Kamera Calendar. It goes without saying that a big thank you must go to Ruth for contacting me and offering me the calendar first, but also to Don for his love of Harrison Marks back in 1960 and keeping this calendar in such good condition. So as the title says the best £15 ever spent on a Kamera Calendar and all going to a very good cause – Thanks Don!